Our facility has 70-75 seats. When laid out with tables (cabaret style), the show room holds about 50-60 seats. Other layouts vary in number, depending on which of our different seating plans is in effect. Basic rental rates below do not include crew. Lyric Hyperion Staff will show your team where things are and how to get started, and oversee that you break down clean up after yourselves. If you need ongoing tech/crew, we can add that to your rental at a negotiable rate. Overtime costs extra. If your show is looking for a home ask us about recurring slots. Your booking is confirmed after we get your finalized contract and payment. We require the first half of rent to reserve, then the other half on or before the rental date. Rates vary based on show type, time, and special accommodations. Please inquire for a custom quote. 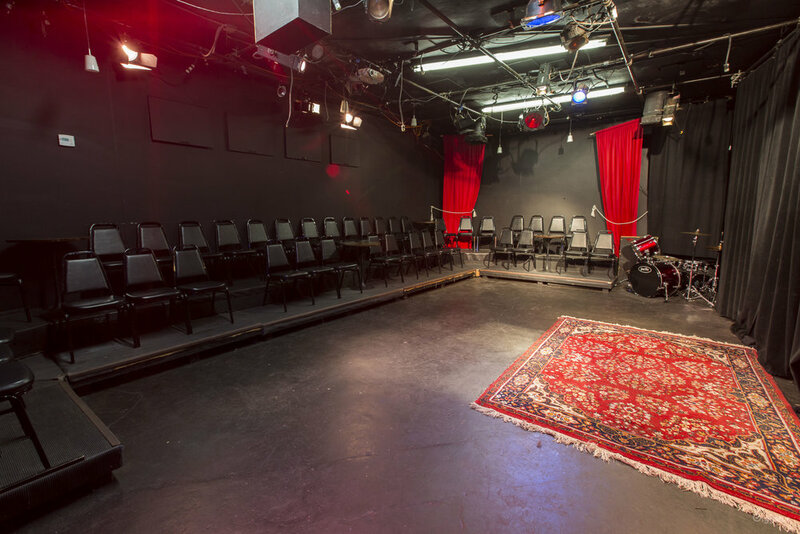 Contact rent@lyrichyperion.com or use the Rental Submission Form above with a detailed description of your event and tech needs. A fully refundable SECURITY DEPOSIT will be required with all rentals. This deposit covers negligent use of theatre equipment, performer no-show, or going over your time slot.